The state Senate today approved a fiscally responsible budget for Fiscal Year 2018-2019 that holds the line on spending, increases funding for education and school safety initiatives, and includes no new taxes. After several years of embracing conservative budgeting, today we find ourselves on stronger financial footing. An on-time budget with limited spending that avoids unnecessary tax increases is an example of how government can deliver services in a responsible manner on behalf of our taxpayers. The final spending total for the 2018-19 budget is $32.7 billion, below the rate of inflation. The budget recognizes the importance of three industries that have historically been among Pennsylvania’s most critical sectors of the economy: agriculture, manufacturing and tourism, restoring funding that the Governor’s original budget plan cut. Passing a fiscally responsible budget this year is an absolute necessity in the face of the daunting challenges we will face in the years to come. But with those challenges come new opportunities that could set our Commonwealth on the path to a brighter economic future. In addition, Senate Bill 1142 would require schools to provide employees with mandatory training on school safety and security.). 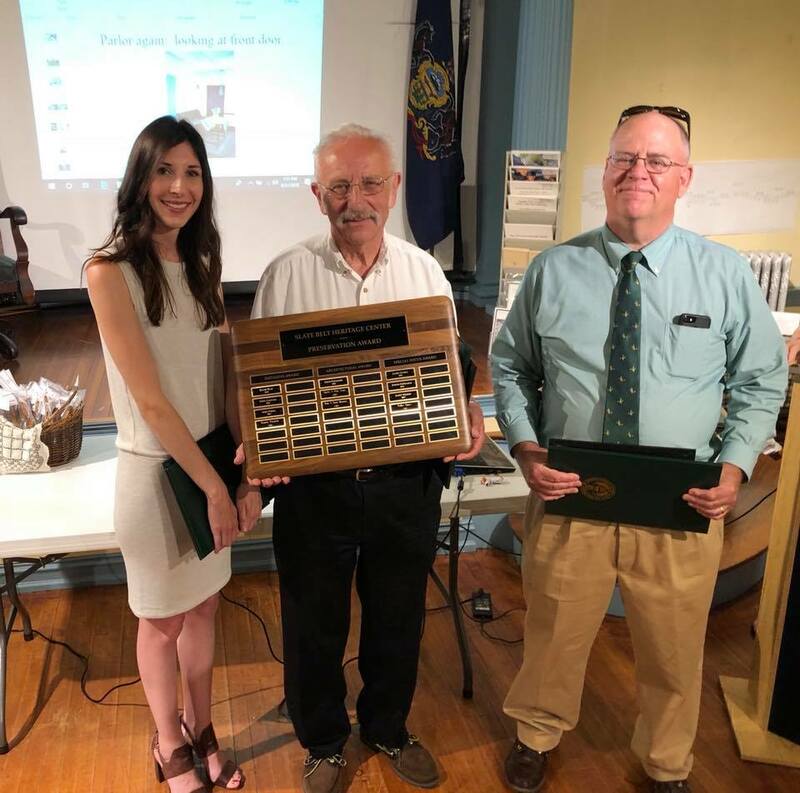 The Slate Belt Heritage Center recently recognized three outstanding local citizens for their annual Preservation Awards. Each was recognized for their work in preserving an element of local history. Walter Emery was recognized for his continued work compiling an extensive postcard collection depicting different sites throughout the Slate Belt and old photographs of area one-room schools. Peter and Karen Marmaras were honored for their work to restore their 1752 era house while staying true to its historical character. Thank you all for your continued work on behalf of our community. If you have not yet visited the Slate Belt Heritage Center, I would encourage you to pay a visit and view the many local artifacts on display. They are located at 30 N. 1st Street in Bangor. 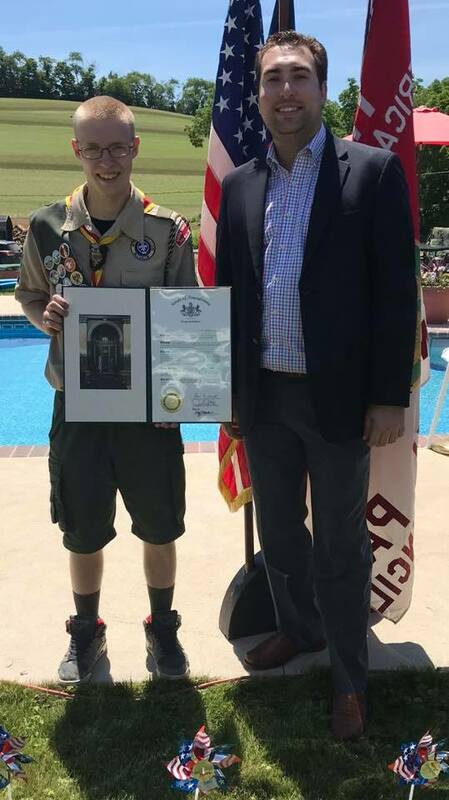 Congratulations to Justin Anthony of Troop 33 for earning the rank of Eagle Scout! For his project, Justin refurbished a bird blind, built a fire pit and constructed a breezeway kiosk at Waste Management’s Environmental Education Center in Pen Argyl. Families and other members of the community gathered at the Education Center earlier this year for Earth Day festivities, where we witnessed firsthand his quality work. Well done on your accomplishment, Justin!